Belembing darah is a native of Borneo and is known by many local names. 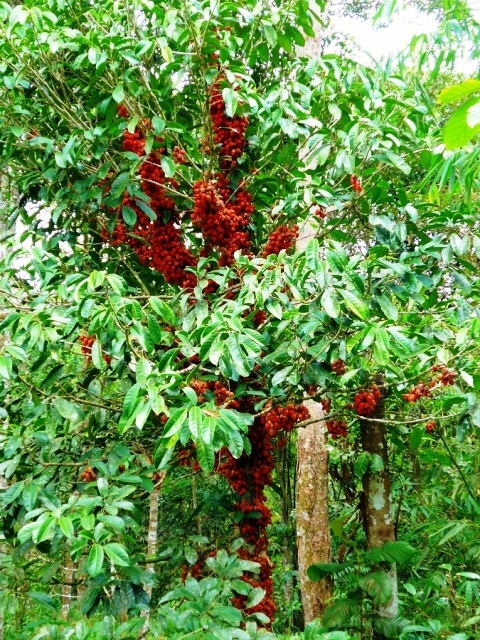 It can be seen growing in Borneo in the tropical primary and secondary riverine and non-riverine rain forests on laterite soils starting from sea level and going upto 800 m above mean sea level. 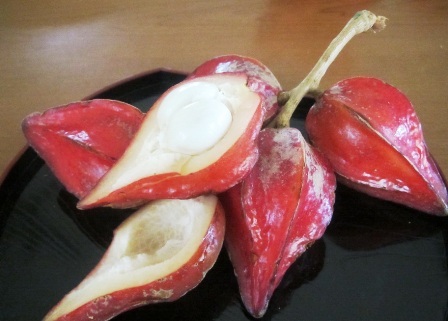 It looks quite similar to tampoi (Baccaurea macrocarpa) but tastes better than that fruit and also has more flesh. A perennial medium sized tree, 6-21 m tall. Leaves elliptic to obovate, 12-40 cm by 4-14 cm, thick, coriaceous, with cuneate to acuminate apex, dark green and borne on 2-12.5 cm petioleswith glabrous to hairy stipules. Staminate inflorescences are cauline, few clustered together; staminate flowers 2-2.6 cm across, pubescent with 2-5 obovate sepals, 6 staminodes, 6 stamens and a hollow obtriangular pistillode; pistillate inflorescences cauline to ramiflorus, solitary, upto seven clustered together, with 8-manyflowered, red; pistillate flower 4-10 mm across, pale yellow to pale yellow to cream yellow to greenish, 5-6 pubescent elliptic, persistent to caduceus sepals, 3-locular, unshaped ovary with 6 wings and persistent to cauducous stigma, with no style. Fruit a berry, obovoid with tapering apex, 5-6 angled start shaped in cross section, 5×2.5 cm, with raised glands present; pericarp red to purple to pink to red brown, 1-2 mm thick, columns 22-25 mm long, straight; pedicel 4-8 mm long. Seeds globose to ellipsoid, laterally flattened, 1-3, cream to greenish, arillode white, edible. 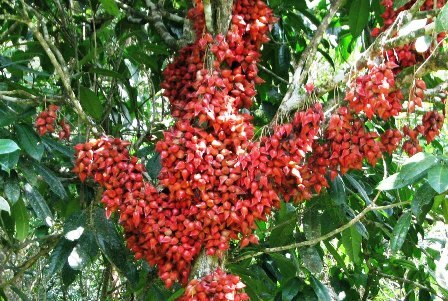 The fruits, though also tasting sour from some trees, are edible and contain protein, carbohydrates, fibre, minerals and vitamin C. Both arriloodes and the pericarp constitute the edible portion. These are eaten fresh and cooked as various vegetable dishes in Borneo. Juice is also made from arillodes and when served chilled, it makes a very good thirst quenching and refreshing drink. Belembing darah trees grow on the banks of fresh water rivers. These love shade and seem to prefer peat soil. New plants are raised from seeds.